What a nice present for Mr. Goldblatt. His latest novel, Twerp, was published a week and a half before his June 8th birthday. One thing I find myself thinking about a lot when I read is the distinct split between the then and now of technology. To be true to a story taking place today, is to have a mobile phone – or a really good reason why you don’t. Sometimes a problem sounds super manufactured and fake when anyone reading knows that kid would have a cell phone. That’s what’s great about the “before” of cell phones. Deadlines can be forgotten, curfews missed, people lost. It is, indeed, a different time with a different pace and, many times, no way to fix the problem easily. I love that Twerp is set in 1969. When I read that, as soon as I finished the book, I had to look up the author to see when he was born. Yep, just as I thought. He, along with Julian Twerski, the protagonist, were each twelve years old in 1969. And what did I love best about the story taking place then? Other than a few references here and there about Vietnam and the Beatles, it had nothing to do with 1969. It could have been set in any year, really, which makes the story timeless. This is the story of everyday life, set at the age where girls become more than annoyances, independence takes on more responsibility and facing your mistakes makes you change how you see yourself and your friends. The reader knows something big happened at the outset, though what it is isn’t yet clear. Julian is told to write about what happened over winter break, and since he can do this instead of reading Julius Caesar, he quickly agrees. Though it takes until the end of the story to discover why Julian and his friends were suspended, there is so much else going on that gives insight to the lives of these boys that the conclusion is richer and fuller and has more meaning once you know what happened. The Bottom Line: A really good coming of age story that can be enjoyed by middle grades and up. 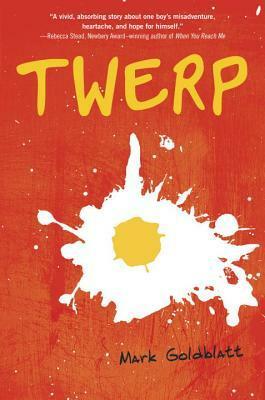 Twerp by Mark Goldblatt was published May 28, 2013 by Random House Books for Young Readers. A free copy of this book was given to Ink and Page in return for an honest review. Big thanks to NetGalley/the Publisher/the Author.